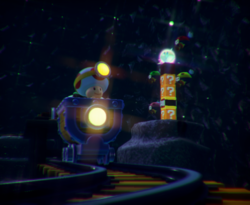 Mine Cart Tunnel Throwdown is the 8th course of Episode 1 in Captain Toad: Treasure Tracker. This level takes place in a cave. Captain Toad starts near a mine cart in which he must get on. He can throw Turnips while in the cart to get Super Gems, break POW Blocks, and defeat Para-Biddybuds. Super Gem 1: Located behind the starting point. The player must turn around immediately and throw a Turnip at it to obtain it. Super Gem 2: Inside a group of blocks that can be broken using the nearby POW Block. Super Gem 3: On top of a moving tower of ? Blocks. Defeated all of the Para-Biddybuds!